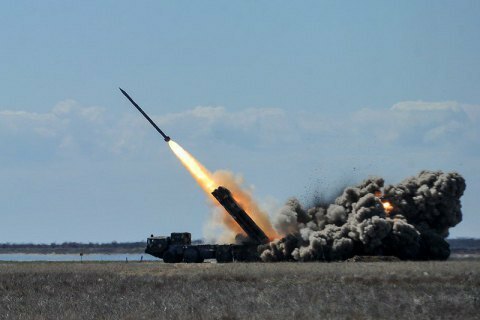 The Vilkha M high-accuracy multiple launch rocket system has been successfully tested in Odesa Region. "I congratulate Ukraine on the successful testing of the Vilkha high-accuracy multiple launch rocket system with an increased range of action, which is long-awaited by the troops," President Petro Poroshenko said on Facebook. He noted that it is very symbolic that the tests took place on NATO’s 70th anniversary. He said that Ukraine would continue to move towards NATO, reform the Armed Forces and increase their combat capabilities. "Ukraine is in fact NATO's eastern flank, trained and well-armed. We are going to NATO not as a beggar but as a full-fledged, equal partner defending democracy and freedom on the European continent, repelling the aggressor - the Russian Federation," Poroshenko said.